The Clever-Lite Wheeled Walker with 8 Inch Casters from Drive Medical helps people that can use a little extra stability when walking. It features front wheels that can be set to either “swivel” or be “fixed”. The Clever-Lite 4 Wheeled Walker features a flip up seat with built-in carry handle. 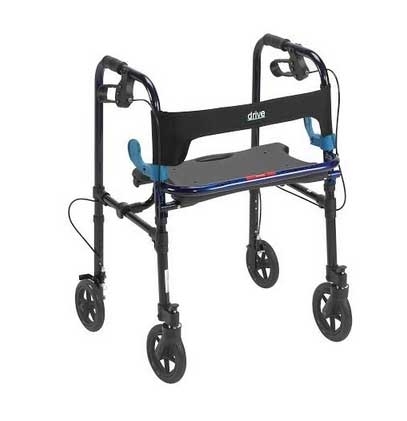 The walker allows individuals to be seated or as use as a traditional walker. Special loop lock style brakes that function like bicycle brakes help provide additional safety and security. The frame of sturdy 1” diameter anodized aluminum construction. The walker folds up for storage or transport. It folds with a patented side-paddle release mechanism.